As I write this, we're lying at anchor at St Pierre, Martinique, French West Indies. Above us rises Mont Pelée, the infamous volcano that in 1902 erupted with such violence that all but two of St Pierre's 30,000 population were killed. Many of the current buildings are constructed on the burned out remains of the original ones, poignant reminders of the horror of that awful event. But on a more cheerful note I've discovered a new favourite beach bar, 'Le Reservoir'. Good beer and very tasty grilled ballyhoo that had been caught in seine nets off the beach earlier that day. Yummee! Le Reservoir Beach Bar and Cafe with Mont Pelée, thankfully now dormant, in the background. Statistics show that most tragic sailing accidents occur on the way back to the boat from dinghy trips ashore, and often involve alcohol. 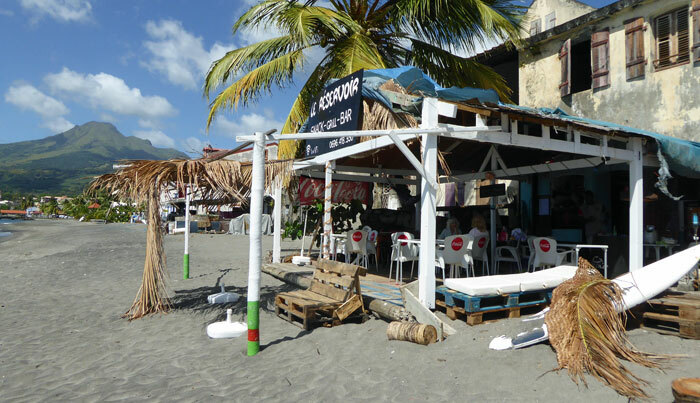 A few weeks back we were enjoying a few 'refreshments' ashore at the Dodgy Dock Bar in True Blue Bay, Grenada. Being of a shy, retiring nature, Mary and I left early leaving our two friends at the bar whose sailboat was anchored close to ours. It was some time later that they set out to return to their boat, during which time it had got seriously dark and the wind had increased to around 25 knots. Our two friends have thousands of miles under their keels and are well past the first flush of youth, so they weren't overjoyed when the outboard stopped some yards short of their anchored boat. Quickly the wind took charge of the situation and during the short period while they dug out and rigged the oars they were blown perilously close to the rocky lee shore on the west side of the bay. Some frantic rowing got them clear, but they were making little progress towards their boat. A series of 'tacks' eventually got them back to their boat, to which the exhausted skipper was clinging on gamely when I found them. They had no flashlight or handheld VHF - and clearly should have known better. Now if they'd been anchored in an open roadstead - like the one outside St Georges - rather than the semi-enclosed True Blue Bay, they wouldn't have got back. End of story. 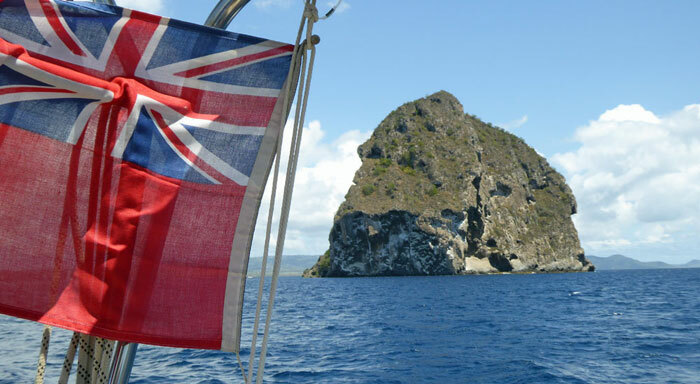 Sailing north from St Anne (Martinique, French West Indies) earlier this month, Alacazam's Red Ensign was alone amongst the tricolours of several local cruising boats as we approached Diamond Rock - a towering basalt monolith that has a remarkably courageous story to tell. Fortunately for the outnumbered crew of Alacazam, the French and British vessels cruising in the West Indies get on relatively well these days; but it wasn’t always so. At the turn of the 19th century the British controlled most of the Caribbean waters, but France still had possession of several of the Windward and Leeward Islands. The British had lost possession of Martinique to France in 1802 and were keen to get it back. But being engaged in defending territories on both sides of the Atlantic, naval resources were stretched to breaking point. Now about a mile off Pointe du Diamant, the southwest tip of Martinique, sits the afore-mentioned Diamond Rock, which was identified by the Admiralty as exactly where they would station a warship if they had one to spare - which they hadn't. So in 1804, and with imagination worthy of C S Forester himself, Diamond Rock was renamed HMS Diamond Rock and commissioned as a warship. Moor More Easy with the EasyMoor? Some mooring buoys have small pick-up buoys attached which you can scoop aboard quickly with a standard boat hook. Others are not so convenient, requiring that you thread your mooring line through the ring that's fixed to the top of it. You need to be able to do it swiftly and easily - and to save embarrassment - get it right first time. And that's what the EasyMoor was designed to do - or so the designers told me. They must have been confident because they sent me one to try out. Do I miss the TV when I'm cruising? No, not one little bit, in fact I'm glad to get away from the cursed thing. With one notable exception - when live Formula One is being broadcast. Watching a recording of a F1 Grand Prix is no substitute. It has to be live, otherwise you can't influence the result by squirming in your seat. Finding a local bar with a TV that is likely to be showing an F1 Grand Prix live takes on a special significance on a race weekend - qualifying on Saturday, the race on Sunday. OK so I'm an F1 addict, sad but true. Chatting to another cruiser the other day, he asked "Are you going to watch England play Wales in the Six Nations Rugby?" "Where?" I asked. "We've got a great wifi signal anchored here in St Anne" he said. " You can watch it on BBC TV on your laptop, on your boat". Intrigued, I probed deeper, and was told all about www.expressvpn.com. Downloading this software on your laptop or tablet for a few dollars a month will apparently enable you to watch global TV wherever you are - unless you're in the US or Australia, where it's blocked. It tried it in Martinique - it worked! Can't wait for the next race! Shear Pin or No Shear Pin? Motoring across the bay in Alacazam's venerable Avon inflatable, the outboard motor started misbehaving. Opening the throttle on the 5hp Yamaha increased the revs as it should and made a lot more noise, but didn't seem to provide any more speed. Shear-pin I thought. No probs, I've got a selection on board to choose from. Back aboard Alacazam with the outboard in the cockpit I set about changing the shear pin. Or I would have done if there had been one, but there wasn't. The prop on my outboard has a synthetic bush built into it - designed to slip to protect the motor - rather than a shear pin. Clever, but mine had decided to slip in normal use, rather than waiting for having a rope wrapped around it or clouting a rock. It wasn't easy to get out - a process involving a vice, a suitably sized wooden dowl and a hammer. In fact I only took it half out as I didn't think it would want to go back in. I cleaned up the exposed part, dried it and applied a liberal amount of thread lock to act as a releasable glue, and hammered it back in. So far so good, it seems to work but will it still slip to protect the motor? Maybe not, so I bought a new prop and have kept the bodged-repair one as a spare. But my question is, what's wrong with the tried and tested shear pin approach? In the event of failure you can change one in a few minutes for just a few cents. But perhaps that's the problem - Yamaha would much prefer to sell you a relatively expensive new prop than a cheap shear pin. Or am I just getting cynical in my old age? Why Disconnect the Exhaust Box? Do I drain the exhaust box when I lay up a boat for winter storage ashore in the UK? Yes definitely. The winters at this latitude can get cold enough to freeze any water left in it with disastrous consequences for the plastic exhaust box. But out here in the Caribbean when we lay up Alacazam ashore for the summer hurricane season, do we bother to drain it then? The answer is no we don't - and it's the wrong answer. "In the hot, humid summer weather, any water left in the exhaust box will evaporate and it will go two ways. Some will escape harmlessly through the exhaust outlet - unless you've closed it off - and some will rise and get back to the engine where, over a period of months, it can cause the exhaust valves to malfunction on launch day." Mike recommends draining the box, disconnecting the exhaust as close to the engine as you can, and stuffing an oily rag into it to keep the exhaust valves lubricated. It makes perfect sense to me, and is now on our to-do list for the hurricane season lay up. Sadly there's been another act of extreme violence in St Vincent. 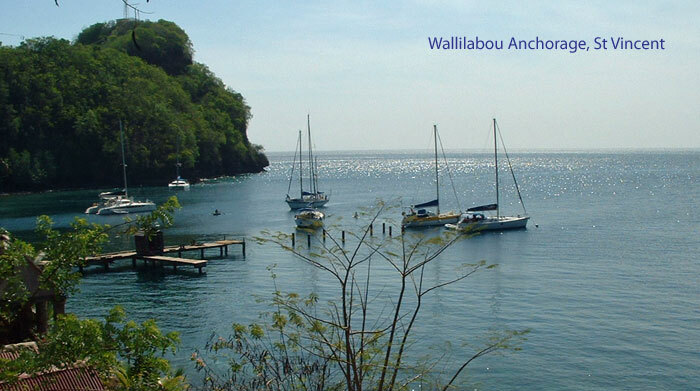 On the 4th March two armed men boarded a German yacht anchored in Wallilabou Bay (pictured below), shot dead one crewmember and injured two others. The day after the murder we were at anchor in the next bay (Kearton's Bay, just around the headland in the photo below) and didn't hear a thing about it. As usual, the local people were friendly, courteous and polite. The statistics for St Vincent are high, 26.5 murders per 100,000 inhabitants, making it the 17th most dangerous country in the world as far as homicide is concerned. Crime happens everywhere, even in the paradise islands of the West Indies, so we'll probably continue to take our chances - but if St Vincent values its tourist trade it's going to need to do something fast about its policing and justice system. If you're thinking of selling your cruising boat - or know someone who is - remember you can advertise it entirely free of charge on sailboat-cruising.com. It could quite literally save you $$$$$thousands! If you know anyone who might be interested in the contents of this newsletter, feel free to email it to them. It's not secret!